I received a surprise in my inbox! Jimbox31 (see his work on deviantART) is the first to create and release an original Poplock toy outside of Alexander Gwynne and myself! "Raptor" is a super cool toy and it takes full advantage of the Poplock system by being easy to put together and being FUN to pose and play with! Download and print your own Raptor with the links below. Jim has enough parts on the pages so that you can even use normal 20 lb printer paper. 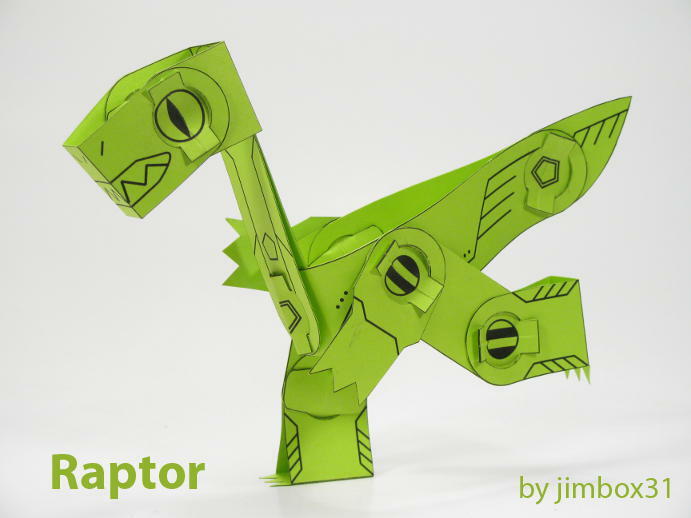 The Raptor from the images below is printed on 65 lb green cardstock. "Oh look! He thinks he's people!"